On all Robert Sorby orders over $50.00 within the 48 states. The turning gouge is the single most important turning tool and is the tool that every amateur should start out with. 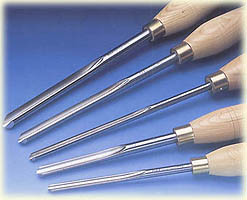 For beginning turners, we recommend the Robert Sorby fingernail profile gouges. These tools offer the most control and are the least likely to "catch" and tear up your work. Robert Sorby produce more turning tools every year than any one else. Robert Sorby's high speed steel turning chisels remains the bench mark by which all others are judged. All of the chisels on this page are made from Robert Sorby's M2 high-speed steel and are suitable for the most rigorous production work. The Robert Sorby Gold Series tools have a Titanium Nitride coating that increases the edge retention by approximately three times over that of standard models. Robert Sorby offers a full selection of bowl gouges with a factory ground fingernail profile. The Robert Sorby fingernail profile turning gouges come with a medium grind which is the easiest to use, but also allows the turner to easily modify the profile if desired. 842FLH-1/4 Fingernail Bowl Gouge 1/4" SALE! 842FLH-3/8 Fingernail Bowl Gouge 3/8" SALE! 842FLH-1/2 Fingernail Bowl Gouge 1/2" SALE! A must in the tool kit of every bowl turner. Milled from round bar, giving both mass and stability. They can produce either massive profiling cuts or delicate as necessary. The Excelsior (Gold) range is made from High Grade High Speed Steel with Titanium Nitride Coating. They have up to 4 times longer cutting edge life. Reduced surface friction gives a smoother cutting action. Length 23", Handle Length 14" 1/4" SALE! Length 23", Handle Length 14" 3/8" SALE! Length 23", Handle Length 14" 1/2" SALE! Length 26-3/4", Handle Length 17" 3/4" SALE!